from being a success story"! This series of unfortunate brownouts is getting us up in the arms. But we can’t just let this be a reason to ruin our summer. We can do other worthwhile activities than just brooding around this awful summer heat. 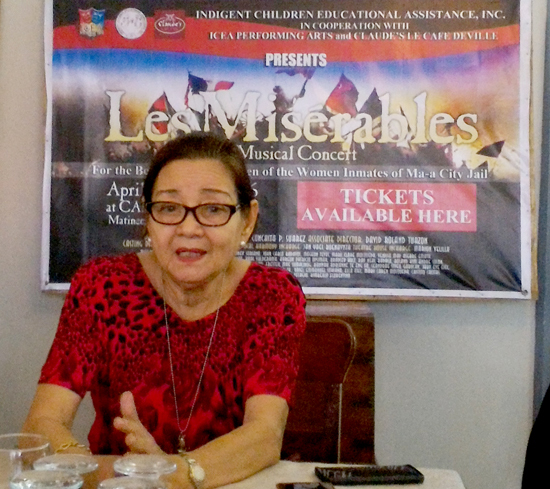 The Indigent Children’s Educational Assistance, Inc. in cooperation with ICEA Performing Arts and Claude’s Le Cafe de Ville will stage a Musical Concert, ‘A Night in Broadway’ featuring the 25th Anniversary Concert of ‘Les Miserables’ this April 30 and May 1, 2016 . This will be staged at CAP Auditorium along Anda St., Davao City. Indigent Children’s Educational Assistance, Inc. headed by their President, Conchita P. Suarez started this fund-raising project for the indigent children in 2007. The group is composed of parishioners of St. Francis of Assisi Parish in Maa and mostly members of CWL. To date, ICEA has already helped hundreds of children with their non-tuition school needs and some have graduated high school successfully. Conchita P. Suarez, President, Indigent Children’s Educational Assistance, Inc.
‘We initiated this project to support the indigent children of Magtuud, Maa, Waan, New Carmen, etc.. We know that there are a lot of families who cannot send their children to school because they cannot afford to buy uniform, shoes, school supplies and other projects,’ said ICEA President, Chit Suarez. This year’s beneficiary will be the 100 indigent children of the Women Inmates of BJMP in Maa City Jail. The proceeds of this musical concert will be used to purchase non-tuition school needs of these children – school uniforms, shoes, school supplies, PTS Fees, Girls and Boys Scout Uniforms, PE Uniforms and other miscellaneous fees. The ICEA Performing Arts home-grown artists will showcase their talents on these evenings to entertain you with their amazing performance. April 30, 2016 – Matinee Show, 4PM. Gala Show, 7PM. May 1, 2016 – Matinee Show, 4PM. Gala Show, 7PM. There will also be a Gala Dinner on April 30 and May 1 that will be hosted by the formidable, Chef Claude at Claude’s Le Cafe de Ville at Rizal St., Davao City. Guests will have Gourmandise Platter for appetizer, Beef Consome for Potage, The Famous Duck Breast A L’orange for main course or Australian Beef Tenderloin for meat lovers. Iced Soufflé for dessert and a glass of excellent Chardonnay will be served as a compliment. I know Davaoenos have a soft heart at helping those who are less fortunate, especially the children. If you want to help more, you can be a special benefactor for only P10,000 – this comes with 4 complimentary show tickets and 4 dinner stubs. 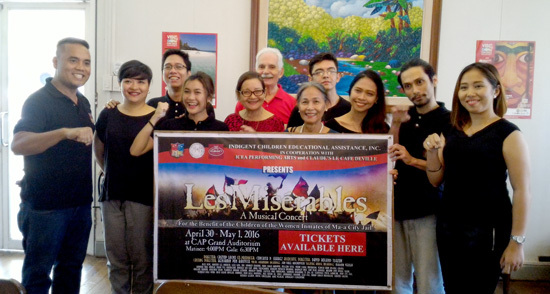 Benefactors for only P5,000.00 with 2 complimentary show tickets and 2 dinner stubs. Sponsors will just have to shell out P2,500 with 1 complimentary ticket and 1 dinner stub. Donors for only P2,000 with 1 complimentary show ticket.